Good evening one and all! I have fallen victim to the call of alcohol inks. Lets face it, it's just plain fun to play with them. It's almost like being a kid again and playing with finger paints! I also admit that its nice to not have any sort of plan when I sit down. I just go for it. I've been having so much fun that now I have several inked pieces sitting around. Time to figure out how to use them! Here is my first attempt to put one to good use. I love the background so much that it's hard to cover parts of it up! 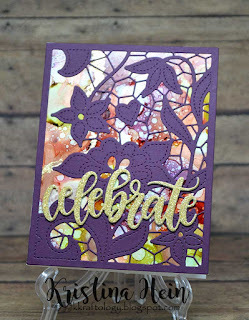 However, this gorgeous new Doodled Lace Cover die from Altenew is just about perfect! It covers up small portions of the background while giving lovely glimpses of the alcohol inks behind. To minimize anymore distractions I used a single word die for the sentiment. My background piece has bits of gold foiling on it. To tie my sentiment to the background, I cut the Celebrate out of gold glitter cardstock. I also cut several layers out of white cardstock and glued them together. It gives the sentiment a little bit extra. And there you have it. I hope to find more ways to use some more of my alcohol ink backgrounds. 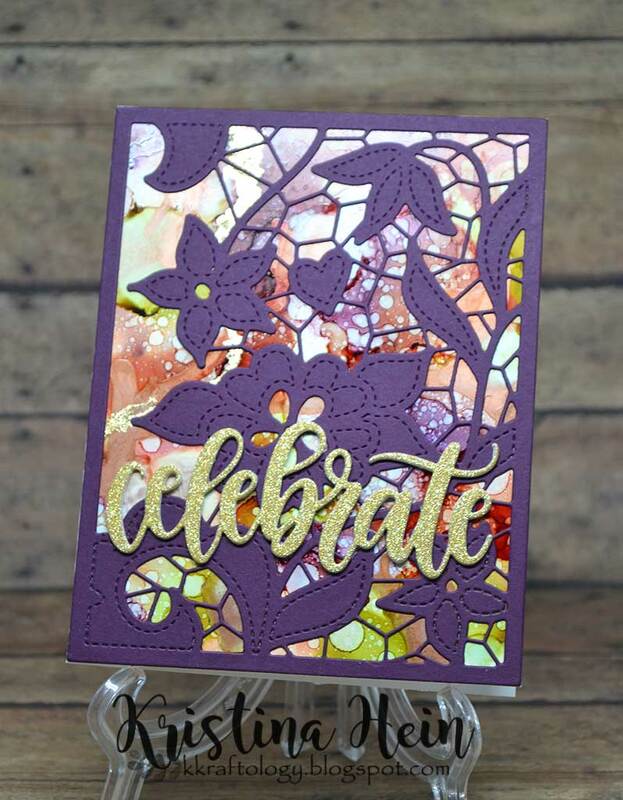 I'd love to hear how you use your alcohol ink backgrounds!